This is a summary. Contact the Archives for additional biographical information. Biography & Genealogy: Born circa 1854 in Buena Vista, Virginia. 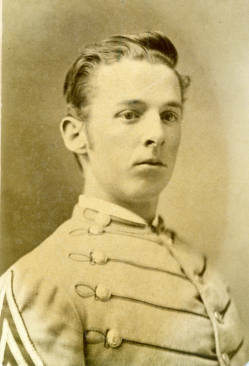 Matriculated September 6, 1871 from Forest Depot, Virginia. Graduated July 2, 1875. Died February 14, 1928. The database currently includes the names of all enrolled students (both graduates and non-graduates) from VMI's opening in 1839 through the World War II era. In addition, you will find biographical and genealogical information, including a summary of military service during the Civil War, for many individuals who attended in the 19th century. The database also includes some historical Faculty and Board of Visitors members, as well as U. S. Army students sent to VMI for training during World Wars I and II. The latter groups were not VMI cadets. For further information about an ancestor listed in the database, please contact the VMI Archives. We can check the complete record, let you know if other information available, and provide copies of original documents. This database is for historical research. We do not release information about living individuals.